My New Forest Bucklers Hard Nelson Shipwrightry information page. The New Forest at Buckler's Hard has a history to tell of Nelson, his ships and shipwrightry......find out more on this great day out. THIS IS AN ARCHIVE PAGE FOR INFORMATION ONLY. Over the Bank Holiday weekend, 1st - 3rd May, archaeology students from the University of Southampton will take a step back in time to the days of Britain’s most famous Royal Navy flag officer, Vice Admiral Horatio Nelson. 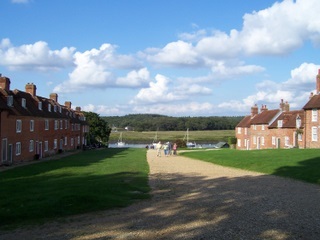 They will spend the weekend at the historic village and visitor attraction of Buckler’s Hard, where ships for Nelson’s Trafalgar fleet were built, getting hands-on experience of using tools and shipbuilding techniques from the 18th and 19th centuries. Visitors can watch as the students convert oak timbers from the Beaulieu Estate, into the main components of the framework of a ship, discovering the challenges faced by shipbuilders of the time, and how they overcame them. 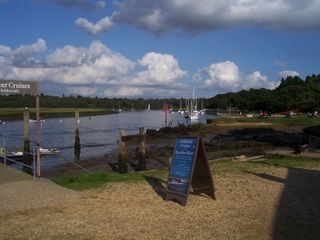 Originally called ‘Montagu Town’ by John, 2nd Duke of Montagu, Buckler’s Hard, nestles on the banks of the Beaulieu River, in the heart of the New Forest National Park. In the Maritime Museum visitors can discover the fascinating story of this unique 18th century shipbuilding village which brings to life the characters who lived here at the time of Henry Adams, the Master Shipbuilder at Buckler’s Hard between 1744 and 1805. Historic displays in the Labourer’s and Shipwright’s cottages show how the village would have looked in the early 1800s and in the New Inn, you can hear residents from the time gossiping about local matters. In the Woodland Walk, children can learn how the local timber at Buckler’s Hard was used to construct ships in the 18th & 19th centuries and the whole family can enjoy a tranquil River Cruise, which transports you on a journey along the river with a commentary revealing the history of the Beaulieu River and the abundant wildlife that inhabits its riverbanks.